Subject:Honors Levi Scott, founder of town, and early area commerce. Few Oregon communities have had a more colorful history than Scottsburg. It was named for Levi Scott, a pioneer of 1844, who homesteaded here and founded the town in 1850. There was a lower town at the head of tidewater on the Umpqua River which became the site of business houses and mills. A mile upstream was the upper town, the distributing and shipping point for the mining regions and communities of southern Oregon. As many as 500 pack animals could be seen loading here at one time. The decline of the community began with the opening of ports nearer the market points in southern Oregon and northern California and the railroad further inland. In December 1861 a great flood wiped out the lower town. 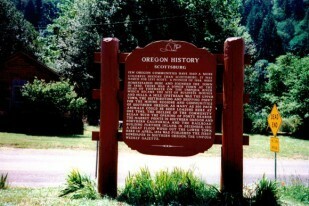 Here in April 1854 was published the first newspaper in southern Oregon, The Umpqua Weekly Gazette.